It’s time to turn that frown upside down! Many of my private weight loss clients have demanding jobs in corporate America. In fact, one of my clients who lost almost 90 lbs in just 3 months was working a full time and very demanding job while she was losing weight! It is possible to stay on track and to stay focused and positive even when you’re working crazy hours. Here are my tips for how to get happier at work. 1. Let go of your annoyance. Just get a bunch of work dumped on your desk? If you’re feeling annoyed, shrug your shoulders up towards your ears and then blow out a bunch of air from your mouth. Physically separate yourself and get rid of your negative energy through your body and breath. 2. Get physical (in a safe way) when you’re angry. Dealing with a frustrating co-worker, and feeling angry? Try this! Squeeze your hands into a fist as hard as you can for 5 seconds, then shake them out. Repeat 3 times. 3. Train your brain to be happy. Simply in a bad mood and you don’t know why? Here’s a silly easy way to flood your brain with happy hormones! Take your fingers and physically move your mouth into a smile. Hold this for 10 seconds to signal to your brain that you’re happy. Smiling, even if you don’t feel like it, actually activates the release of the feel-good neurotransmitters: dopamine, endorphins, and serotonin! 4. Indulge in foods with set limits. Bored at work and reaching for the candy jar? Stash some dried fruit in your desk or have a dark chocolate bar ready to break off one square at a time – it’s very hard to overeat with 70% cocoa chocolate! Too bitter, but satisfies the sweet tooth and increases dopamine levels to give you that quick fix of feeling happy. Feeling sluggish after lunch? Reaching for your mid-afternoon coffee fix? Think again. That coffee may wake you up so much and any caffeine after noon can sabotage your efforts to go to bed at a decent time at night. Instead, stimulate your mind and digestion by chewing on something crunchy with protein. Keep carrots + hummus or pistachios that you have to peel or sliced apples and almond butter to give you that crunch but also that protein you need to keep your energy levels up. 6. Have a purpose for your office stroll. Feeling fatigued or tired after not getting enough sleep? Stand up and walk to the water cooler or bathroom – have a goal in mind – it’s not enough to just tell yourself you’ll get up and walk around the office. Sure, exercise helps your mood and energy levels, but in the moment it’s not enough motivation to get you up. So tell yourself that drinking enough water is imperative to weight loss and health (it is!) or that going to the bathroom is something you should be doing a few times throughout the day for your health! 7. Blast your favorite tunes. If you’re about to quit your job or throw it all in the towel, it’s time to play your favorite song. Get a go-to anthem that pumps you up. I love changing up my current favorite song weekly to make sure it’s fresh and I stay excited to hear it. As a private weight loss coach and a private fitness coach for women, I specialize in helping successful women lose weight. If you’re looking for a life coach, a wellness coach, or a confidence coach in Chicago and beyond, you’ve come to the right place! 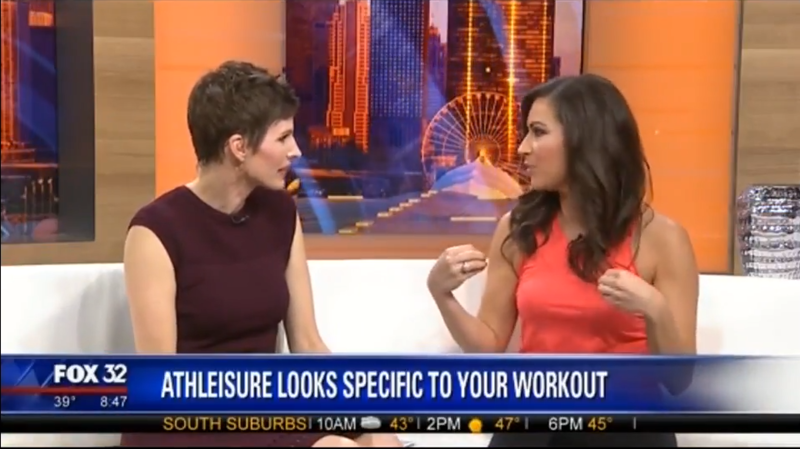 As a certified personal trainer for women, Yoga Instructor in Chicago, Pilates Instructor in Chicagoland, and certified professional life coach in Chicago, I work with successful women across the country as a private weight loss coach for women. Our first model is wearing a look that’s great for Yoga & Pilates. For each of these, you want a layer underneath that won’t roll up when you’re in downward facing dog or going upside down. You also want slip-on shoes so you can slide them off easily and just walk barefoot into the studio. Our second model is a guy! I’ve got a guy’s look to show you because men workout too! This look is great for cycling and spin classes as well as high intensity interval classes. The pants are stylish but still comfortable and allow for movement, and the running shoes that tie up are perfect for a long run or a cross training workout. Our third model is this adorable young lady. We can’t forget teens! This model is wearing a great look that she can wear to school and then to after school activities, or on the weekend to run errands and then go to a play date with friends. Finally, my look is a versatile one. I LOVE going from a workout to brunch with friends. The black pants are slimming, and I can throw on boots or booties to dress it up! Our private wellness programs for women focus on weight loss and incorporate personal training, yoga, Pilates, and body image coaching. Steph is the best weight loss coach for women because of her holistic approach. She also has a doctor-approved diet program just for women who want to lose weight quickly and safely. Steph has been called the best personal trainer in Chicago, and works with women all over the country in her private weight loss programs. As a wellness consultant, Steph is an on-air Health & Fitness Expert as well as a corporate wellness speaker for many companies. She loves going on TV to share her passion for health, fitness, and weight loss. If you’re looking for more workout inspiration, make sure you join my FREE 21 day challenge at stepitupchallenge.com. If you’ve made a commitment to weight loss or health in 2018, you’re not alone! Dreaming of your swimsuit body already? Fitness and Nutrition Expert Stephanie Mansour dropped by The Jam to show you how to lose 20 lbs by summer. Check out my Four Pillars of Holistic Health to stay in the zone and motivated to keep your New Year’s resolutions! Pick a nutrition plan that works for you. You can be on a vegan or paleo diet or the Atkin’s or a low FODMAP diet—it doesn’t matter! I know, as a Weight Loss Coach, that the most important thing is to get in tune with the science of your own body! The goal is to lose 1-2 pounds per week, so the most important thing you can pay attention to (no matter your diet) is regulating your blood sugar. Be sure to eat a protein with a fruit or veggie every few hours to keep sugar and carb cravings down. Maybe you had a great day and stuck to your diet and hit your caloric intake! Hurrah! But then you find yourself bored and alone at home on the couch. What do you do? You start eating! If you find yourself eating out of boredom, stress, sadness or any other emotional reason, then write down what you’re feeling in a notebook. Once you are in tune with your emotions and understand what is causing you to eat, you will be able to cut back on the excess. Knowledge is power! Treat yourself to things that support your health and fitness. When you reward yourself with something like a new pair of workout shoes for trail running or a stylish tote, like this trendy bag from Holly and Tanager, that you can take straight from work to the gym, you’ll feel really good about continuing to exercise and eat right. Keep your fitness routine fun and fresh. If you’re bored at the gym or your strength training circuit no longer gives you the results you want, try something new. My free 21-day challenge offers full workouts, and I have my Step it Up With Steph DVD with tons of various cardio and strength exercises you can try! Beat the winter blues with the new KINOMAP! This awesome app digitally transports you to sunny and beautiful landscapes around the world with over 70,000 miles of trails for cyclists, runners, or rowers! 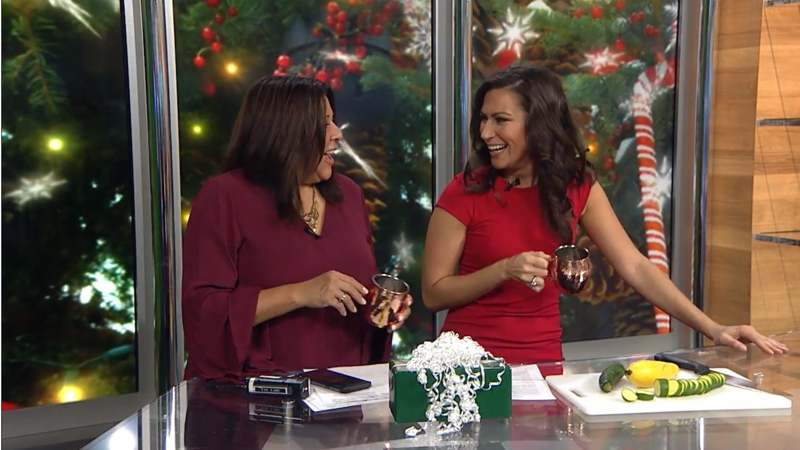 Health and Fitness Expert Stephanie Mansour delivers strategies to make your New Year’s resolutions for weight loss a success! 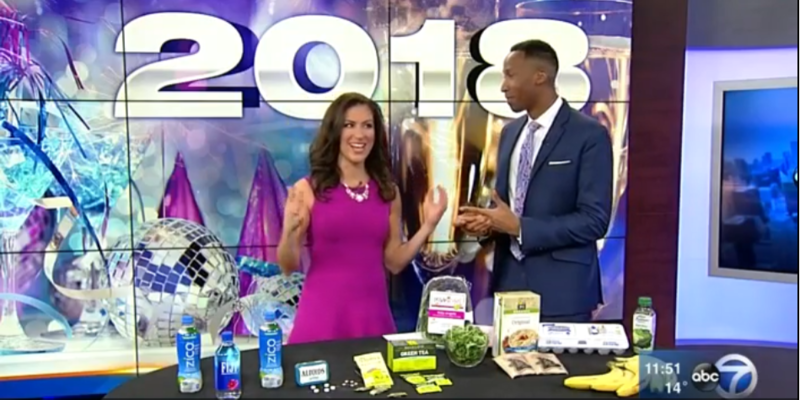 Steph chatted with HLN to share lifestyle tips that help reality check your resolutions and show you how to foster a positive, happy YOU in the New Year. It’s easy to feel motivated and in charge heading into the New Year! Want to keep the momentum going and make your big goals a reality? Then, take a look at my top three New Year’s resolutions tips that I share with all my private weight loss clients. Success is all about realistic and attainable goals. Find out how to stay motivated all year long and make 2018 your best year of health and fitness yet! A super common New Year’s resolution is to lose 20+ pounds. But how long do you think that should take? The average woman can only lose 1-2 pounds per week. Unless you have the help and accountability of a weight loss coach, this is the norm. In other words, it’s nearly impossible to lose 20 pounds in one month, so instead go week by week and break your big goal down into smaller and more attainable chunks. Invest in a simple calendar where you can track weekly goals. As a weight loss coach, I recommend scheduling three days a week to exercise. It’s also crucial to set aside one day a week to meal plan and prep. Then, take a look at your entire week and scale back your expectations in case there is an unexpected party or work commitment that makes it impossible to meet your goals. When you stay flexible with your schedule but committed to making healthy choices, you will steer clear of the vicious cycle of guilt that many women enter when they don’t live up to their fitness expectations. Remember, it’s all about learning to view your choices as either healthy or unhealthy. When you make an unhealthy choice, don’t beat yourself up about it…just get back on track with the next choice you make! When you’ve done something positive for your body and your health, then treat yourself! (But not with sugary or high calorie foods!). Treat yourself to a new sports bra, favorite perfume, or indulge in a facial, a night out at the movies, or new exotic fruit for your morning smoothie. Whatever motivates you, use that as your reward!